Mission Statement: We partner with neighbors, schools, community & faith groups to work for a sustainable future for ourselves & succeeding generations. *Earth Day: Monday, April 22nd; Do your green thing in your own space or with a neighbor; in the evening at 6:30 pm. go to Loyola's screening of an Earth Day Special "The Happening" at Damien Center Cinema. Seating start 6:00 pm. *Spring Green & Clean: Saturday, April 27th 9 to Noon. Sign up with 48th Ward to volunteer your services. 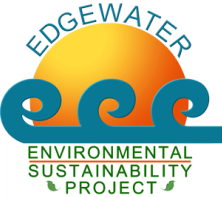 2) Recycle/ReUse: Edgewater-wide garage and yard sale will be Saturday, June 1. 3) Yard Waste Pick-Up: Department of Streets & Sanitation coordinates dedicated bagged leaf and other yard waste collection trucks to assist residents in clearing their yards, parkways, and storm drains of leaf debris. Call 311 to request separate yard waste collection. Trucks will collect the bags and take them to be composted. 4) Tips Section - Find five native plants for your garden that attract & provide food for birds & butterflies, as well as ideas on recycling, energy efficiency, clean air practices. ​​1) Carbon dioxide – which is the gas scientists say is most responsible for global warming – has reached levels in our atmosphere (411 ppm; 02/2019) not seen in 3 million years, scientists announced this week in a new study. At that time, sea levels were as much as 65 feet higher than they are now, Greenland was mostly green and Antarctica had trees. “It seems we’re now pushing our home planet beyond any climatic conditions experienced during the entire current geological period, the Quaternary,” said study lead author Matteo Willeit of the Potsdam Institute for Climate Impact Research in Germany. 2) The U.S. Department of Agriculture (USDA) has formalized & updated their maps of “hardiness zones” ranges — strips of similar climate that run roughly east-to-west across the country (except in the high mountains and coasts). NOAA has created similar maps based on the annual lowest temperature climate normals for a 30-year period. Zone 3 (average annual lowest temperature of -40 to -30°F) only allows the hardiest of plants, such as garlic and asparagus. Zone 10 (30 to 40°F) allows for tomatillos and other heat-tolerant species. The map shows most regions in between, with occasional inconsistencies due to local microclimates. As temperatures rise and habitats shift due to human-caused climate change, these planting zones are shifting north. Compared to a 1951-1980 baseline, the average coldest temperatures of 1989-2018 are more than 3°F warmer for the average city. Temperatures have increased for more than 95 percent of the 244 stations analyzed. The map shows the location of the monthly meetings on the second Wednesday : 9 to 10 am 5533 North Broadway.